Being that this is the time of year when we celebrate the birth of Jesus by giving one another all sorts of things that we don’t really need (check out the Advent Conspiracy for a counter-consumerist idea of Christmas), I thought it right to offer a small gift to you all…in the form of two versions of a song CALLED “The Gift (I Burn for You)” which has something of a fun history behind it. 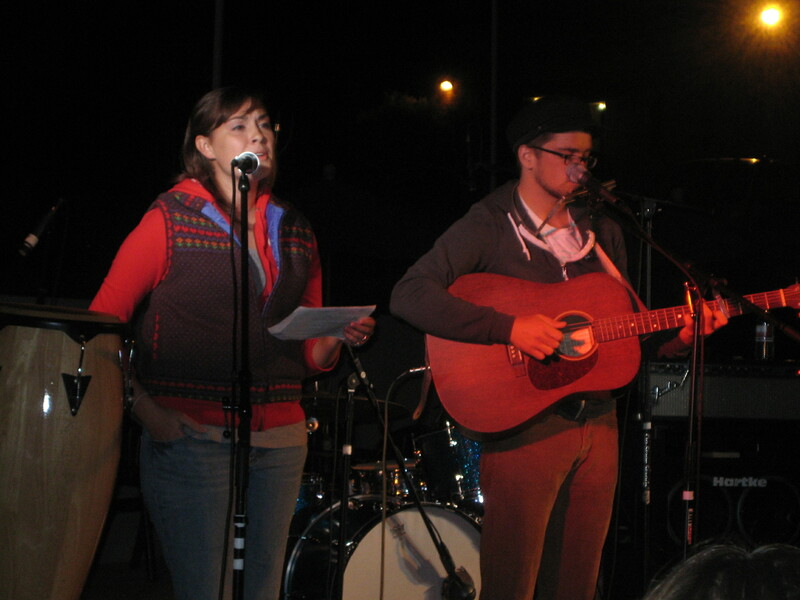 In December 2007, Sufjan Stevens created what was called “The Great Sufjan Song Xmas Xchange,” which was basically a contest where anyone could submit a Christmas-themed song to Sufjan’s label, Asthmatic Kitty, and there would be a process of judging the songs with the winner being given the rights to a holiday song that Sufjan had composed. I had written a number of songs in the past (30 or so) and felt like I could possibly come up with something creative enough to submit, and I had a few wonderfully talented friends whom I thought I could bring together to play/sing on the song in order to make it sound much better than I ever could myself. So, I began brainstorming ideas for this submission. I am embarrassed to admit that I believe it was the movie, The Holiday, with Kate Winslet that actually planted the seed of a song idea in my mind. My wife was watching it and I caught just a glimpse of a scene where the character played by Ms. Winslet was giving a present to a man who was something of an unrequited love (if I’m remembering correctly). I started thinking of how painful it would be to have put a great deal of time and energy into finding a present, which represented the deep affections in one’s own heart, and giving it to a person who could/would not appreciate what it truly meant. So I started thinking of a story that would become the song I submitted. The melody and structure of the song came to me quite easily, but it is a rather simple composition (verse/pre-chorus/chorus repeated three times with no bridge). I asked one of my RA’s at the time (and a dear friend ever after), Erin Hennessy, to sing the song, as it was written from a female perspective and she has an eminently lovely voice, and I tried to form a one-off band with the ever talented Josh McBride, Jon Crosswhite, Justin Botz, and the one-and-only genius wunderkind, Elijah Wade Smith. Well, as the deadline approached, my superband did not pan out, but Elijah did record Erin and I playing the song the night before the contest deadline and so we submitted it to Sufjan as “Erin Hennessy & Sgt. Grumbles,” which was my pen name at the time (though due to a technical glitch, it was a mono recording and could only be heard from one side of a stereo system…Randall Wetzig later used some connections to fix this problem for your listening convenience). There were songs with banjos and ukuleles, songs with synthesizer strings, songs with Casio beats, techno beats, beat boxing, sugary shaker sounds and tambourines. There were songs in Latin, songs in Danish, songs in multiple key signatures, songs with vocoders, songs with Rhodes pianos, toy pianos, multiple xylophones, precious songs with Midwestern accents, sardonic songs with English accents, whistling songs, songs with wrapping paper as metaphor for an overbearing lover, songs as advice columns to Santa, as advice columns to ex-lovers, songs with reed organs and mouth organs and pipe organs. Songs with references to Henry James, in-laws, more ex-girlfriends, abstract ambient songs with twinkling bells and silver glitter, no-nonsense songs with the curmudgeon-y sneer of a Grinch, songs about innocence and forgiveness, songs about spite and regret, songs with great big bear hugs and songs with wintry gazes, songs with reminiscent, sentimental choruses, songs with the names of soccer players and American tycoons, songs with sleigh bells and happy rapping, songs with the thumping back beats of reindeer hooves, screaming children, bumbling boo hoos, bah-humbugs, songs with the beating hearts of all mankind. These were the generous songs of many creative voices participating in the convoluted mysteries of the Christmas tube sock! Yes! Last Christmas, I received one of the best Christmas gifts ever, as Josh, Erin and Jon re-arranged and recorded “The Gift” and sent it to me, complete with banjo, sing-along “la-la” parts, and most cleverly, Josh’s voice singing the parts spoken by the man in the song under Erin’s lead vocal. While I’m sure you will enjoy their rendering of this tune, because of the sweet friendship and affection which I hear in every note, I think it is simply one of the most lovely things I’ve ever heard! I’ve included the original version here so you can hear Erin’s beautiful voice more clearly (the new version was recorded via the mic on a laptop) and to see the brilliance of the re-arrangement! And a fire burns as I wait for you as if all my waiting was through. A record player and 40 LP’s—I searched hard for your favorite bands. The time has come to open my heart and accept whatever may happen or not. Like Jesus the savior of men. When you show up and take off your jacket, you’re wearing the sweater I gave to you. Then you look away, I go make some coffee. You ask me to borrow some Henry James. It’s dark inside, my face is warm from shame and from tears and a hope that’s lost. Should I give it away? I know it can’t stay, but I spent all my money on it. I kneel by the fire and then throw it in so that no one can ever hear it again. Your brilliance is beyond my consequence. I love this song. I still have it on my iPod, and the first time I played it with Britt in the car she was blown away at how good it was. Thing is, I didn’t say, “This is Erin with Greg and Eli” or anything. She just said that she really liked it then asked who it was. So anyway, good stuff. Thanks for bringing it back around. That’s so cool…Erin’s voice carries it. The comment is a little belated but this is amazing!